The Derby Cane Rosewood Stain is approximately 36"-37" long with a derby handle, accent collar, and has a rosewood stain. 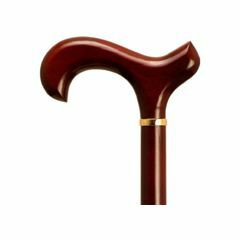 This traditional Derby Cane is a great walking cane for any occasion. Extremely please with the cane. Supports Weight. Lightweight. Easy To Use. Safe. Stores Easily. Very pleased with the cane. It is extremely helpful when I have a long walk or on my feet for an extended period of time. The cane relieves the pressure and restores my posture. I have had good comments about the style and color of the cane. Easy To Use. Safe. Supports Weight. Long Distances. Short Distances. Indoors. Outdoors. They are a great value. On my next one I will put a coating on them to help keep them from getting scratches. I ordered a cane #MNT05019. Does this cane come with a rubber tip? IS THIS A WOOD CANE AND CAN IT BE CUT SHORTER IF REQUIRED? IS THERE AN ADDITIONAL SHIPPING CHARGE?